This week, the city pulled three bus shelter ads that showed a man entering a door marked "Ladies Showers." The ad was to encourage people to contact their city councillors to mandate restroom usage. One city councillor worries it's harmed an already fractured relationship. 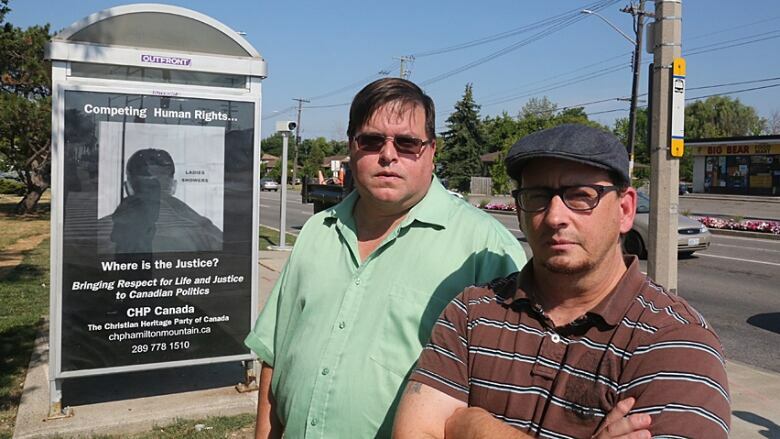 Hamilton city council reaffirmed its commitment to transgender rights Friday after allowing a damning bus shelter ad targeting the transgender community's use of gendered public restrooms this month. But one city councillor says he fears the ad added "insult to injury" in an already fractured relationship. A Christian Heritage Party (CHP) ad appeared at three Mountain HSR stops this month showing a man about to enter a door marked "Ladies Showers." It read "Where is the justice?" The ad took aim at the "bathroom debate" — the notion that people who are transgender should be forced to use the washroom that corresponds with the gender on their birth certificate. The CHP also distributed 3,500 flyers to Mountain homes. The city pulled the ad hours after being informed of it. But by then, some in the LGBTQ community felt the ad had already added "insult to injury," said Aidan Johnson, Ward 1 councillor. This is especially true since the city settled an Ontario Human Rights Tribunal case in April after a guard at the MacNab bus terminal stopped a transgender woman from using the women's washroom. "I received some feedback from the LGBTQ community," Johnson said after Friday's city council meeting. "Coming out of the pain of this past year around the HSR litigation, the ads were seen as, if you will, adding insult to injury. That's a coherent and fair response. "We do not want to add insult to injury." The motion reaffirmed the city's commitment to "full equality of transgender and gender non-conformist people." It also vowed to look at how the ads were posted to begin with. The city uses a third-party company, Outfront Media, for HSR ads. The company is supposed to flag potentially problematic ads so city senior management can examine them, spokesperson Jasmine Graham said this week. It's looking at how this one escaped their notice. The Ontario Human Rights Tribunal has already ordered the city to "codify" its policies to incorporate transgender rights, as well as train staff and post signage. Graham said it's in the process of doing that. The city also flew the transgender pride flag at city hall in June for the first time ever to mark Pride month. 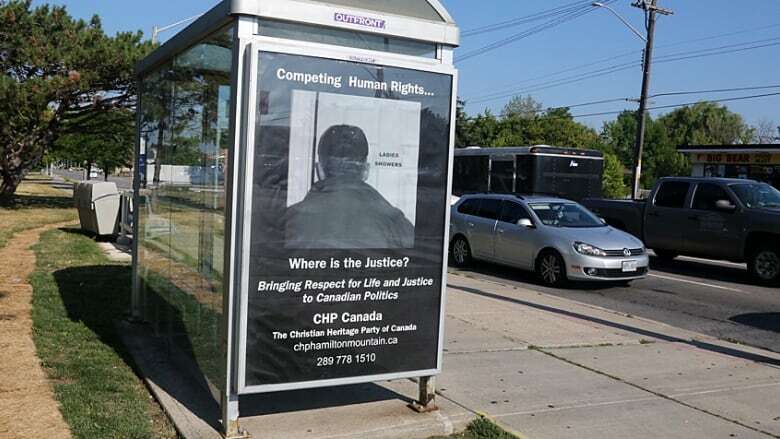 Hamilton Mountain CHP candidate Jim Enos placed the ads. He says the city shouldn't have settled with the tribunal, and that a third single-stall washroom should be enough to satisfy the human rights code. "To go any farther is putting the other person's rights and needs over someone else's," he said this week. In an email to the mayor, Enos also said that public policy should be open to public scrutiny. Moved by Coun. Aidan Johnson. Seconded by Mayor Fred Eisenberger. 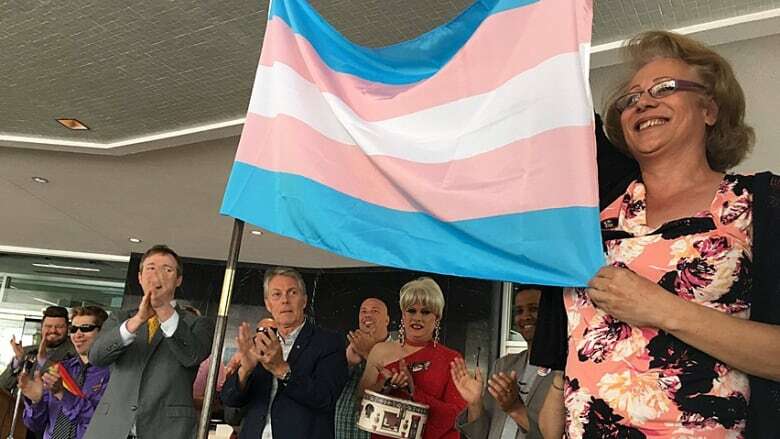 (c) That Council re-affirms the commitment it made last spring, in voting to raise the Transgender Pride Flag at City Hall and in resolving relevant human rights litigation, to the full equality of transgender and gender non-conformist people.